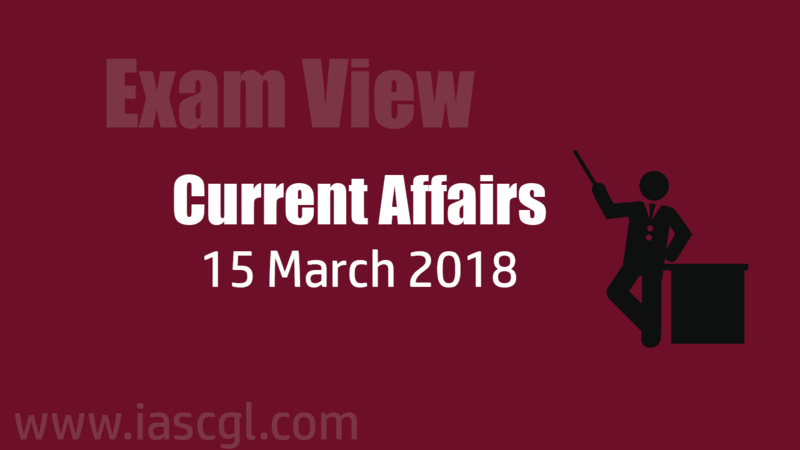 Current Affair of 15 April 2018, Exam View. On Saturday, April 14, 2018, India celebrated the 127th birth anniversary of Bhim Rao Ambedkar. Popularly known as Babasaheb, he was an Indian jurist, economist, politician and social reformer who inspired the Dalit Buddhist Movement and campaigned against social discrimination against untouchables since he was a Dalit too and also supported the rights of women and labour. However, Ambedkar’s importance in Indian history cannot just be limited to a person who championed for the rights of the poor, downtrodden and lower caste people. He can easily be remembered as “The Father of the Constitution of India” and the man who fought for the oppressed in the country. He was the principal architect of our Constitution and a founding father of the Republic of India. PM Narendra Modi took the metro during rush hour on his way to inaugurate Dr Ambedkar National Memorial on the eve of the Dalit icon’s birth anniversary. As the nation celebrates the 127th birth anniversary of Baba Saheb Bhim Rao Ambedkar and remembers his contribution for the country, Prime Minister Narendra Modi launched the first phase of Ayushman Bharat health programme from Bijapur in Chhattisgarh. The Prime Minister also inaugurated the first phase of the Bastar Internet scheme under which a 40,000-km-long network of fibre optics cable would be spread across the seven districts of the tribal region. The Prime Minister Modi also inaugurated bank branches in seven villages and visited rural BPO centre developed under the India BPO promotion scheme. The BPO centre is provided Internet by the Bastar internet scheme. 2nd India Mobile Congress to be held in New Delhi in October 2018. The India Mobile Congress 2018 … is an excellent platform for policymakers, industry, and regulators to engage in meaningful deliberations to drive the future direction of this important sector. The event will be hosted jointly by the Department of Telecommunications (DoT) and the Cellular Operators Association of India (COAI) under the theme ‘New Digital Horizons: Connect, Create, Innovate’. More than 1,300 exhibitors are scheduled to take part in the exhibition this year, and over 200,000 professionals from various sectors of the country’s tech industry expected to be in attendance. Delegates are expected from telecom, Internet of Things (IoT), Big Data, Artificial Intelligence (AI), Smart Cities, and other sectors. The intra-state e-way bill will come into effect from April 20, 2018. The e-way bill would be mandatory for intra-state movement of goods also in the state. The chief minister said the state government has been expanding the e-governance in a planned manner towards making working easy and transparent. The Union Government recently announced to constitute a Task Force under the Chairmanship of Jayant Sinha, Minister of State for Civil Aviation, for fast-tracking the roll-out of Unmanned Aerial Vehicle (UAV) technology. The Task Force will build up a strategy to accelerate the development of Unmanned Aerial Vehicle Technology with implementable recommendations for Central Government, State Governments, industries and research institutions. The Headquarters of the Task Force will be at Union Ministry of Civil Aviation, New Delhi. 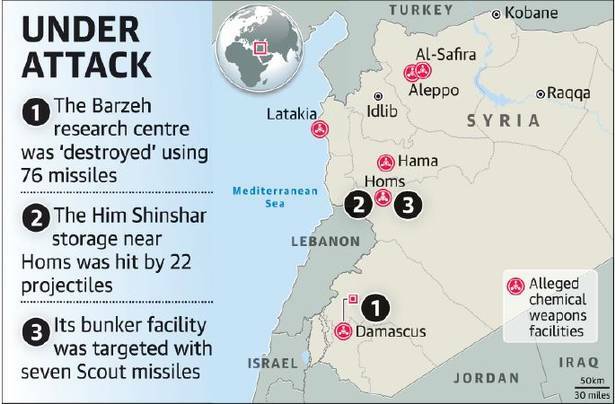 The US, Britain and France on Friday night launched more than 100 missiles against Syrian targets in a strike against the Assad regime’s chemical weapons capabilities, but stopped short of attacking Russian or Iranian targets in order to avoid triggering a broader conflict. French President Emmanuel Macron said the strikes had been limited so far to Syria’s chemical weapons facilities. Paris released a dossier which it said showed Damascus was to blame for the poison gas attack on Douma, the last town holding out in a rebel-held swathe of territory near Damascus which government forces have recaptured in this year's biggest offensive. Washington described its targets as a centre near Damascus for the research, development, production and testing of chemical and biological weapons, a chemical weapons storage site near the city of Homs and another site near Homs that stored chemical weapons equipment and housed a command post. Seven MoUs were signed between Indian and Russian companies recently at the ongoing DefExpo that was formally inaugurated by Prime Minister Narendra Modi. City-based Ananth Technologies and JSC Concern Radio-Electronic Technologies (KRET) inked pact for product support to develop defence systems and to manufacture spare parts and providing service and maintenance for such items. According to an Embassy of Kazakhstan release, a delegation from Kazakhstan, led by the Vice-Minister of Energy, M. Mirzagaliyev, held talks with the Indian delegation led by Minister for Petroleum and Natural Gas Dharmendra Pradhan with the assistance of Kazakhstan's Ambassador to India Bulat Sarsenbaye. According to an Embassy of Kazakhstan release, a delegation from Kazakhstan, led by the Vice-Minister of Energy, M. Mirzagaliyev, held talks with the Indian delegation led by Minister for Petroleum and Natural Gas Dharmendra Pradhan with the assistance of Kazakhstan's Ambassador to India Bulat Sarsenbayev and other embassy officials. The bilateral component of the talks focussed on "The future of global energy security - transition, technology, trade and investment", as well as how both Kazakhstan and India could enhance their cooperation in the energy sector within the framework of the IEF and the Gas Exporting Countries Forum or GECF. The IEF is the largest international energy organisation to promote inter-governmental dialogue between countries that export, consume and transit energy resources. Citing tragic road accidents in India and Canada, UN Deputy Secretary-General Amina Mohammed termed traffic deaths an urgent global concern as the world body launched a trust fund aimed at spurring action to help save lives in road accidents. The United Nations took a major step to address the tragedy of road accidents by launching the UN Road Safety Trust Fund to spur action that could save lives and prevent the loss of opportunity associated with road accidents. Highlighting the opportunities offered by the fund, Mohammed said there is "a chance to save the lives of millions of people around the world, and to prevent injuries, suffering and the loss of opportunity associated with road accidents. Two Indian men and a woman have been sentenced to 517 years each in jail by a Dubai court for swindling thousands of people in a multi-million-dollar fraud case. Sydney Lemos, from Mapusa in north Goa, was the chief executive of Exential, a forex trading company in Dubai Media City. Investors lost over $200 million when Exential failed to pay out after promising 120 per cent returns on a $25,000 (Dirham 91,800) investment. The accused — Lemos, his wife Valany and Ryan D’Souza — were convicted on Sunday by the Dubai Misdemeanours Court in the 515 cases filed against them and were sentenced to one year in jail each in 513 cases and two years in jail for the remaining two cases, total jail of 513+2+2=517 years. Neeraj Chopra became the first-ever Indian to win gold in javelin throw at the Commonwealth Games. Boxing: Gaurav Solanki has become the second Indian male boxer after Suranjoy Singh (2010) to win gold in the flyweight category (52kg) at the Commonwealth Games. Wrestling: Mausam Khatri bagged silver after losing to South Africa’s Martin Erasmus in the men’s freestyle 97kg final to give India its 39th medal at the Commonwealth Games 2018. Boxer Amit Panghal clinched silver in the men’s 46-49kg event to take India’s medal tally in boxing at the CWG 2018 to five. Wrestler Pooja Dhanda won silver in the women’s freestyle 57 kg event in the Commonwealth Games on Friday, giving India its sixth medal. Nineteen-year-old Naman Tanwar won India its first boxing medal at the 2018 Commonwealth Games, winning a bronze in the men’s 91 kg category. Five-time world champion and Olympic bronze medallist MC Mary Kom has become the first Indian woman boxer to win a gold medal at the Commonwealth Games. Elusor macrurus is popularly known as Mary River’s turtle. It was added to the “EDGE of Existence” list of endangered species compiled by the Zoological Society of London (ZSL). It is a native of Queensland of Australia and lives only in the Mary River from which it takes its name. They have specialized organs in their cloaca which process oxygen from the surrounding water. 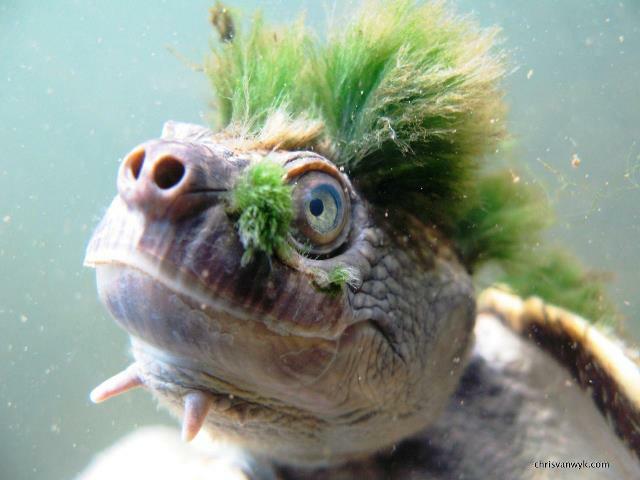 The turtle’s most distinguishing feature is the bright green, spiky Mohawks sprouting on the heads of some. However they are not hair but algae that cover them as they are underwater for a long period of time. According to IUCN Red List they are endangered species. The National Film Awards, announced in New Delhi today, posthumously awarded two icons of Indian cinema - Sridevi, who drowned in a Dubai hotel bathroom in February, won her first National Film Award for Best Actress for her performance in MOM. Vinod Khanna, who died last year, will receive the Dadasaheb Phalke award, India's highest film honour.